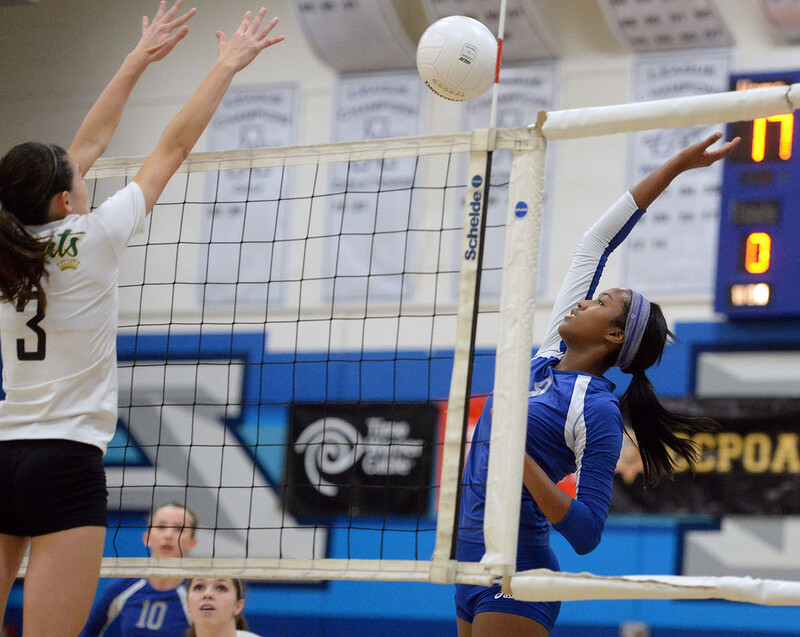 The Alta Loma volleyball team had quite the season. The Braves won a Mt. Baldy League title, cruised to a Southern Section title (Division 4AA) and went all the way to the state championship match. Three of the key figures from that team signed their letters of intent today, making their college decision official. Two will be staying close to home and one will be in commuter distance. Middle blocker Amy Armstrong will play at Cal State San Bernardino, a prominent player on the national scene at the Division II level. Libero Kristen Sanchez will play at University of La Verne, which has national Elite Eight appearances at the Division III level. Outside hitter Breanna Golsch will move on to Cal State Dominguez Hills, which plays in the same conference as Cal State San Bernardino and another local, Cal Poly Pomona. 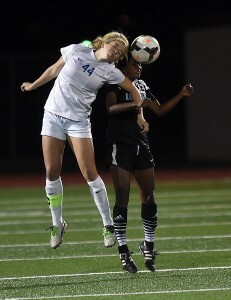 A fourth player, Aeryn Owens, signed in February with Cal State Northridge. Good luck in the next step of your career girls. Alta Loma High School volleyball standout Kristen Sanchez (center) wanted to choose a college relatively close to home. She did just that. committing to University of La Verne today. Sanchez was team captain and starting libero for a Braves team that won Mt. Baldy League, Southern Section (Division 4AA) and Southern California Regional (Division 4) titles. The Braves (36-3) also finished at state runner-up, losing the title match to Sonora 3-2. She tallied a team-high 459 digs and was a first-team All-Inland Valley selection. Sanchez also considered Vanguard and Concordia-Irvine as well as Grand Canyon University (Ariz). Sanchez has a twin brother T.J. who will also be attending the school. The two went to a campus orientation together. They wanted to got to schools close together but it worked out they liked the same one. The two are close. T.J. is known to the school’s volleyball enthusiasts as the guy who dressed up as the banana and led the cheering section at the team’s matches. The University of La Verne volleyball team, coached by Jenna Panatier, went 20-7 last season. The Leopards advanced to the postseason but lost a first round NCAA Division III match to Trinity (Tex.) 3-0 at Cal Lutheran University. Amy Armstrong of Alta Loma wanted to stay close to home for college and she was lucky to find a premier program in commuter distance. The 6-foot-1 middle blocker has committed to Cal State San Bernardino a dominant competitor in the California Collegiate Athletic Conference and a figure on the national scene under veteran coach Kim Cherniss. Cherniss and assistant Danny Scott have done an outstanding job of developing players at the middle blocker position and have churned out several All-Americans there. They had two there last year in Tori May and Brenna McIntosh. May has graduated while McIntosh will be a senior. Cherniss has also been good at maintaining a local presence on her roster. Yes she’ll go out and get that top recruit from elsewhere but there are always local players on her roster as well. Armstrong was a key player for a Braves team that is coming off its best season in school history. Alta Loma (36-3) easily won the Mt. 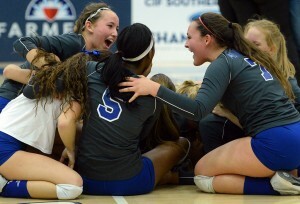 Baldy League and cruised to a Southern Section title. They went on to the state playoffs and marched all the way to the state title game before being dealt a 3-2 loss. Armstrong, a first-team Mt. Baldy League selection, registered 171 kills and a team-high 109 blocks. She was also considering Cal State East Bay and New Mexico-Highlands, both Division II schools. Alta Loma High School senior volleyball standout Breanna Golsch has committed to NCAA Division II Cal State Dominguez Hills. She visited the school earlier this week and liked what she saw. “I liked the coach and I got a good feeling from all the players,” she said. Golsch was team captain for a Braves team that just recorded the best season in school history. They went 36-3, winning Mt. Baldy League and Southern Section (Division 4AA) honors. The Braves also fared well in the state portion of the playoffs, advancing all the way to the state championship before falling to Sonora in a five-set match. Golsch was third on the team in kills with 256. She also recorded 66 aces, 44 total blocks and 191 digs. She was a first team All-League and second-team All-Inland Valley selection. Golsch plans to major in secondary education. The Alta Loma girls soccer team is good, really good. It is ranked No. 1 in Division 5 so others outside of the Inland Empire know the talent on that team. 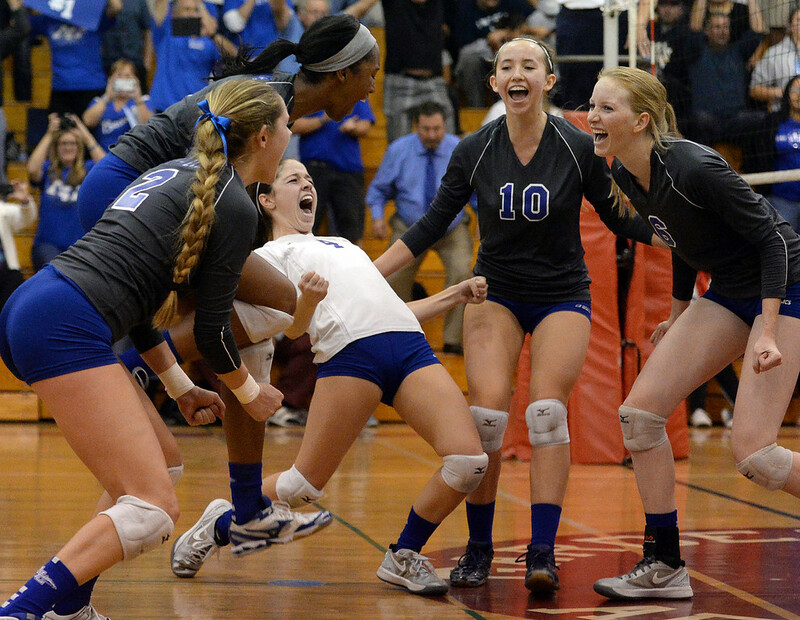 The Alta Loma volleyball had its best season in school history the past fall, cruising to a league title then winning a Southern Section Division 4AA title just as convincingly. Then came a run in the state portion of the playoffs. They finished as runner-up, winning the Southern Region and losing to North Region champ Sonora in the state title tilt. The volleyball team was third in the Baseline last year before making the move but the girls soccer team WAS the Baseline champion a year ago. So its chances to win a Southern Section title are pretty good. And they dropped all the way to Division 5, rather than 4. 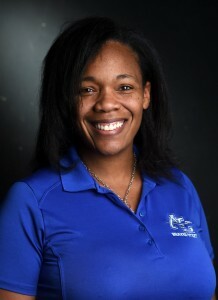 So the biggest task for coach Ben Davies, much like it was for volleyball coach Tishanna Pope, is to keep his team focused and steadily improving when it is playing inferior competition. Playing some good non-league foes is a good start. And the Braves played Rancho Cucamonga and Los Osos, among others. That’s good from a competition aspect and good that they have kept the rivalry going. We’ll see if the Braves can get the ultimate prize just as the volleyball team did. One thing is for sure, its shaping up to be a good year for the school in many sports. Most Valuable Players – Aeryn Owens, Sr., Alta Loma; Breanna Golsch, Sr., Alta Loma. It seems every coach that wins a CIF Southern Section title laments the difficulty in getting a team back up again to start the state playoffs. Alta Loma volleyball coach Tishanna Pope now faces that challenge after her team cruised to a Division 4AA title. The Braves (33-2) have won 22 straight matches, the most recent being a 3-0 sweep of La Reina on Friday in the title tilt. The Braves are the top seed for the Division 4 Southern California Region portion of the state playoffs which start Tuesday. Alta Loma will host Kingsburg at 7 p.m. in their state playoff opener. Since they’re the No. 1 seed they’ll play at home until they’re eliminated or get to the state title match which is on a neutral court. 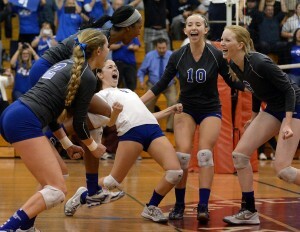 It’s one more to go for the spirited Alta Loma High School volleyball team. The Braves (32-2) turned in a convincing 3-0 win over Garden Grove on Tuesday night in one Division 4AA semifinal to earn a spot in Friday’s title game against La Reina (29-8) which defeated St. Paul 3-1. Many will say they’re making a run because they dropped from Division 1A to 4AA, the result of moving from a competitive Baseline League to a not-competitive at all Mt. Baldy League. This one has been a few years in the making for coach Tishanna Pope who has eight seniors on her 10-person squad. It’s a tight-knit squad and has been since the core of the team arrived as freshmen. But this team can play. I don’t care what division they’re in. Among their wins this season was one over Riverside King, which made the semifinals in 1A and eventually lost to top seed Aliso Niguel. They also have a win over 2A finalist South Torrance. One of their two losses was to Village Christian, the team that will play South Torrance for a title. Pope has done a masterful job of bringing this team along and she had a pretty big challenge ahead of her this year. Yes she had an experienced team that seemed to poised to make a run. But she also had to find a way to keep this team focused and sharp when it had no equal in the league. It’s a lot easier to get fired up and focused when you’re playing longtime rivals like Los Osos and Rancho Cucamonga. When you’re competition is the other schools in the Mt. Baldy, well, not so easy to get up to play every match. Aeryn Owens has emerged as one of the area’s premier players. But the Braves a lot of solid players around her, all of whom have excelled in the role they’re asked to hold down. This team has also been No. 1 all season and it’s not always easy to play with the target on your back. They’re so close to finishing the job!